Aliyah Ajmal pictured with her Blue Tan rabbit. '''Copyright Andy Thompson Photography. Tayside & Kincardineshire Rabbit & Cavy Club held a rabbit show in the Scout Hall, Stonehaven. 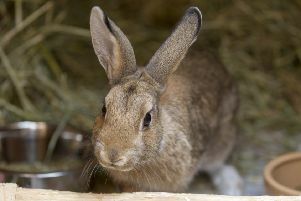 The event held on March 23 was a two-star licenced show which means it was run under British Rabbit Council rules. It covered all breeds, split into four sections, fancy, lop, fur and rex. Tayside and Kincardine Rabbit Club held their show on Sunday at the Scout Hut in Stonehaven. 'Taylor McGruther pictured looking at one of the Huslustlander rabbits. '''Copyright Andy Thompson Photography. Each rabbit was judged both against the breed standard, the “ideal” and against the other rabbits in the class. Aliyah Ajmal and her blue tan rabbit, won Best Fancy, Best Junior and Best In Show. Aliyah is from West Lothian and fairly new to showing rabbits, but this was her second Best In Show award. The other winners were Rosalind Spence, from Stonehaven, winning Best Lop with a red-eyed white Dwarf Lop, Karen Smith,Kennoway, winning Best Rex with a tricoloured Dalmatian Rex and Jane Wallace, from Thurso, winning Best Fur and Reserve Best In Show with her Hulstlander. The show was a two-star licenced show which means it is run under British Rabbit Council rules. Judge Derek Scrimger takes notes after looking at one of the entries. ''Copyright Andy Thompson Photography.